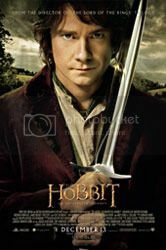 The Hobbit: An Unexpected Journey is the first part of a trilogy chronicling the adventures of Bilbo Baggins and 13 dwarves under the leadership of Thorin Oakenshield and Gandalf the Grey, who are on a quest to reclaim Erebor, one of the last great Dwarven kingdoms, from the dragon, Smaug. Director Peter Jackson (and the studio/s, presumably) decided earlier this year that The Hobbit would not be just two movies as planned, but three. This, I thought, was a horrible idea. The book it is based on, The Hobbit, is the light-hearted (and much shorter) prelude to The Lord of the Rings. The brevity and lightness of The Hobbit means it simply can’t be split into three movies without adding lots of unnecessary plot points. Sure enough, there was plenty of that. Some of it somewhat necessary, some really not. It is difficult to judge most of the additions at this time because there are two more movies to go and we don’t know how Peter Jackson and his team have put the story together. I think only the dwarvish musical bits are the outright unnecessary parts. The rest are dubious, but just possibly not so bad in the end – we’ll have to see how the other two movies turn out. The story didn’t drag as badly as I imagined it would, despite the over-reliance on battle scenes and chase sequences to drive the pace. However, I think it really didn’t need to be nearly three hours long. Cut it into half and it would have been just right. Martin Freeman does well as Bilbo, and Andy Serkis makes a magnificent Gollum (again). The “Riddles in the Dark” scene between Bilbo and Gollum has to be one of the best sequences in this film, with Gollum’s bipolar tendencies being displayed through effective application of dialogue and acting. I marveled at how Hugo Weaving actually looked younger than he did in LOTR – kudos to the makeup team. The dwarves seem generally well-cast and Sylvester McCoy was a charming and rather endearing Radagast. Many critic reviews have complained about the new frame rate (48fps) but I didn’t have any trouble watching the movie. Then again, I strongly suspect it was shown at the regular 24fps frame rate here. I doubt our cinemas – or many cinemas elsewhere – are fully equipped to screen movies at higher frame rates. I chose to watch it in digital 2D instead of 3D and I’m glad that I did. I think the 3D would have given me a headache or just seemed gimmicky. There were many scenes where I got the impression that they were shot that way in order to take advantage of the 3D effect. Well, they did use proper 3D cameras to film it so that makes sense. Yet it’s almost too much. In 2D, there’s a bit less of a gimmicky feel but had I viewed this in 3D I think I would have very rapidly gotten tired of things flying at the screen, and the long sweeping camera moves. The 3D cameras were PJ’s new set of toys and he clearly had lots of fun with them in the same way that Spielberg enjoyed crazy flying shots in Tintin (because Spielberg hadn’t worked in the limitless world of animation before). Thus, the flaws were also the same. It felt a teensy bit overdone. The production design and the music is as good as ever. Concept artists Alan Lee and John Howe still have their mark all over the look of the movie, costume design is all right (I find it difficult to comment on the design of Dwarvish garments) and NZ’s tourism industry is sure to benefit from all the amazing scenic shots in the movie. Howard Shore’s score is interestingly similar to his scores for the three LOTR movies, yet not exactly the same. You can still pick out certain themes – such as the Hobbiton theme, and the Fellowship theme, and others – and that musical connection is nice. I rather liked the main motif for this movie (first minute or so of this). I groaned in my seat when they started singing ‘That’s What Bilbo Baggins Hates’. It felt a little forced. I do like the Misty Mountains song, though. It had a poignancy to it that echoed the Dwarves’ loss. And I loved how the production design for Thranduil and his army looked a little more severe and menacing than those from Lorien or Rivendell. It makes the Mirkwood elves look a little wilder. Good point about the Mirkwood elves’ design! I still dislike Thranduil’s crown a lot (I think it looks a bit silly) but otherwise, yes, from the tiny bit we saw of them, definitely different and interesting.